December 12, 2012 - Delta Air Lines and Virgin Atlantic Airways have reached an agreement for a new joint venture that will create an expanded trans-Atlantic network and enhance competition between the U.K. and North America, offering greater benefits for customers traveling on those routes. As part of this joint venture agreement, Delta will invest $360 million in Virgin Atlantic, acquiring a 49 percent stake currently held by Singapore Airlines. Virgin Group and Sir Richard Branson will retain the majority 51 percent stake and Virgin Atlantic Airways will retain its brand and operating certificate. Both carries will integrate a joint venture that will operate on a "metal neutral" basis with both airlines sharing the costs and revenues from all joint venture flights. The carriers will combine trans-Atlantic network between the United Kingdom and North America with 31 peak-day round-trip flights. The venture will enhanced benefits for customers including cooperation on services between New York and London, with a combined total of nine daily round-trip flights from London-Heathrow to John F. Kennedy International Airport and Newark Liberty International Airport including reciprocal frequent flyer benefits and shared access to Delta Sky Club and Virgin Atlantic Clubhouse airport lounges for elite passengers. Corporate and travel agency customers of both airlines also will benefit from an aligned sales effort on both sides of the Atlantic. The airlines will file an application with the U.S. Department of Transportation for antitrust immunity, which will allow a closer relationship and coordination on schedules and operations. The transaction also will be reviewed by the U.S. Department of Justice and the European Union's competition regulator and other relevant authorities. The share purchase and the joint venture are expected to be implemented by the end of 2013. Steve Ridgway, Virgin Atlantic Chief Executive, added: "Consumers will reap the rewards of this partnership between two great airline brands on services from the UK to the USA, Canada and Mexico through a shared ethos in the highest standards of customer service. This joint venture will deliver much more effective competition at Heathrow. "Both airlines are confident that the Department of Transportation will be as convinced as we are of the extensive consumer benefits arising from this joint venture, with expedited approval being granted by the end of 2013. The trans-Atlantic market is Virgin Atlantic's heartland - it's where we started. By aligning with Delta we can continue to grow our North American network and offer greatly enhanced connectivity across the USA." 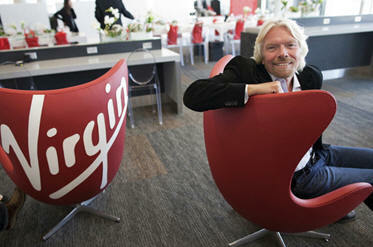 Virgin Atlantic President, Sir Richard Branson, commented: "This is an exciting day in Virgin Atlantic history. It signals the start of a new era of expansion, financial growth and many opportunities for our customers and our business. I truly look forward to the possibilities our partnership with Delta will offer. We have always been known for our innovation and service and have punched above our weight for 28 years. That is why our customers love us so much. We will retain that independent spirit but move forward in a strengthened partnership with Delta." Delta and Virgin Atlantic customers will be able to earn and redeem miles across Delta's SkyMiles and Virgin Atlantic's FlyingClub frequent flyer programs. Premium customers also will have reciprocal access to the Delta Sky Club and Virgin Atlantic Clubhouse airport lounges. Full details will be announced as services become available. As part of a $3 billion investment in enhanced global products, services and airport facilities, all of Delta's flights between the U.S. and London-Heathrow feature full flat-bed seats offering direct aisle access in the BusinessElite cabin. These flights also offer Delta's popular Economy Comfort seating in the forward section of the economy cabin. Economy Comfort offers four additional inches of legroom and 50 percent more recline compared to standard economy seats. All cabins offer in-seat audio and video on demand with a broad range of in-flight entertainment options. Delta also will begin introducing in-flight WiFi service on international flights beginning in 2013. Virgin Atlantic has recently completed a £150m upgrade program. A new Upper Class cabin has been introduced across its Airbus A330 aircraft, which features the longest fully flat bed in the sky. This is complemented by a redesigned onboard bar and new Clubhouses at both JFK and Newark airports. The airline's Boeing 747 leisure fleet has been completely refitted and features onboard connectivity and VERA Touch Virgin Atlantic's award-winning touch screen in-flight entertainment system offering passengers hours of entertainment at their fingertips.